Branding. It’s the new-ish buzzword for an old concept: first impressions matter. That is why we’ll help you put your best foot forward through a strong and unique corporate ID. We start with a discovery session where we’ll play psychologist and ask the questions that gain insight into your company’s ethos. From there we’ll show you sketches that show icon, font and color suggestions. We then work closely with you to finalize what will be your lasting brand. Once you have your logo you’ll want to start putting it everywhere! We’ll provide you export files so that you can do just that. We can provide a style guide that details the usage of your corporate look & feel elements for outside vendors and internal staff. We also create business cards and stationery, brochures and other corporate collateral to assure a consistent look and feel for your brand. After all, you want that 100th impression to be as strong and identifiable as that first one. Your ID’s uniformity must carry through to your website and electronic communications, including email signatures and eblasts. Because we specialize in the cross-pollination of digital and print, we’re the one-stop shop for your company’s ID needs. If it can be printed, we can design it: brochures, business cards, stationery, ads, booklets, signs, t-shirts, posters, book covers, exhibit booths. These are just some of the items we’ve designed and arranged the printing of. We could go on, but you get the idea. If you’ve got multiple pieces we’ll make sure that they work in concert together, including your website. If you’ve got something that you don’t see listed, that doesn’t mean that we haven’t done it–just that we didn’t list it! Oh boy have we fixed a lot of bad websites. Fortunately, unlike bad plastic surgery, your website is a fluid medium that can be fixed! Maybe you don’t have a website yet, but want to build it correctly from the start. We’ve been designing websites since before most people were using the internet (really, we’ve been doing this since 1996!) We’ve watched web development blossom from a medium of limited design and functionality to a robust platform that allows e-commerce, custom applications and even the ability for clients to update their own sites via WordPress. We start with a deep dive through your current site (if you have one), followed by an in-depth discovery session where we’ll find out more about your company and your objectives for your website. Once you approve our best-faith estimate and we’ve established a schedule, we dive into creating the look and feel, navigation and flow that is unique to your company and supports your call to action. We primarily work with WordPress, although we can also develop a semi-custom site with HTML and CSS, or build fully-custom sites from wireframing through hard launch. However we build it, we promise a beautiful, SEO-ready, fully-functioning site. If we can’t do it in-house we have a partner who can. We work with incredibly talented writers, photographers, programmers, printers and marketing experts. We’ll be the Wizard of Oz, managing the project team so that you only have to talk with us and not a bunch of specialists. You’ll thank us that we’ll spare you from talking to the programmers! 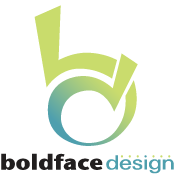 Copyright © 2018 Boldface Design Group, Inc. All rights reserved.